In affiliation with the United States Soccer Federation, we offer upgrade courses that can educate and guide an individual USSF member through the upward movement to higher levels of our game. Referee upgrade requirements can be found in the Library Documents in the certification requirements document according to referee grade. There are 6 separate components for upgrade. Minimum time in grade must be ONE (1) calendar year, Teaching modules-Online or Classroom, Written Test, Fitness Test, Game assessments, and Game Log History (minimum number of career games). The Fitness test is a separate course and $25 registration fee. Game assessments are coordinated with the respective ARA, who also receives the game log, and verifies time in grade. The written test is included in the online teaching modules. The written test is open book. On October 1, 2018 the Referee Grade 8 to 7 upgrade course classroom training opened and is 100% online. The course will be open for 3 months, closing December 31, 2018 EXTENDED TO JANUARY 31, 2019. The classroom training should be complete before a fitness test is demonstrated and passed. The fitness test requirement must be performed at a fitness test event and must be passed within 6 months before the upgrade is submitted complete. Any makeup fitness test due to a previous failure will be charged a makeup fee. 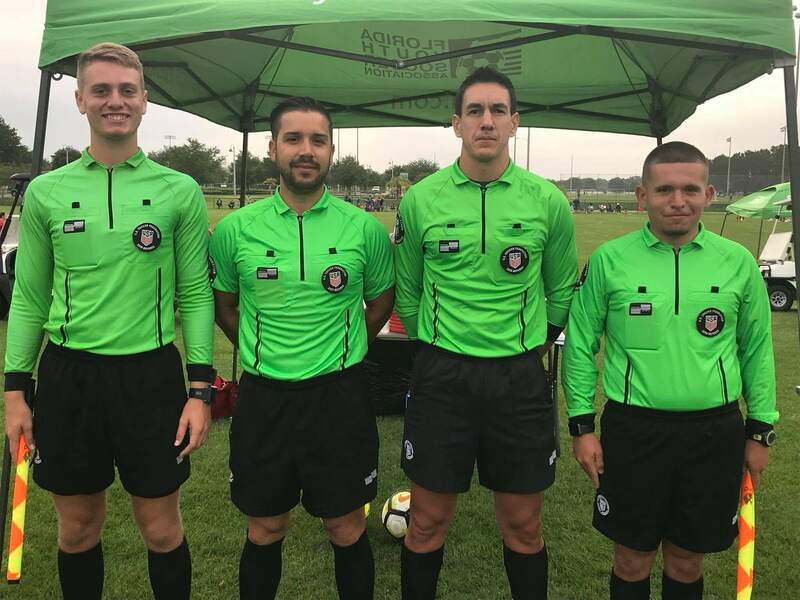 Contact a local Area Referee Administrator for the planned upcoming fitness test event date on February 23, 2019 at the University of Tampa. After paying the fees, press the ONLINE Lessons button next to this clinic on your home page to take the lessons. All lessons must be completed and an 80 scored on the written test. 2019 RECERTIFICATION MUST BE COMPLETE IN ORDER TO TAKE ANY COURSE FOR UPGRADE. On November 1, 2018 the Referee Grade 7 to 6 upgrade course classroom training opened and is 100% online. The course will be open for 3 months, closing January 31, 2019. The classroom training should be complete before a fitness test is demonstrated and passed. The fitness test requirement must be performed at a fitness test event and must be passed within 6 months before upgrade is submitted complete. Any makeup fitness test due to a previous failure will be charged a makeup fee. Contact a local Area Referee Administrator for the planned upcoming fitness test event date on February 23, 2019 at the University of Tampa. 2019 RECERTIFICATION MUST BE COMPLETE IN ORDER TO TAKE ANY COURSE FOR UPGRADE.